Your doctor says that your melanoma is stage IIA (T2bN0M0) and Breslow depth of 2 mm. You wonder what foreign language she's speaking—indeed, melanoma jargon can be confusing and exasperating. To help you understand why a particular treatment was chosen for you, here is a brief explanation of what these terms mean. 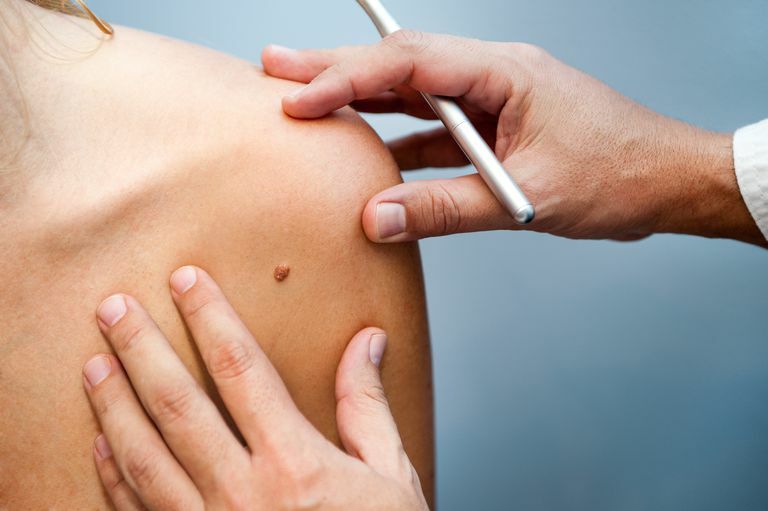 If your doctor sees a suspicious mole during a skin exam, the next step is a skin biopsy. If the biopsy reveals a melanoma, the pathologist will examine the biopsy to determine the stage (extent) of the disease in order to effectively plan your treatment. Besides the TNM number, you may also hear the doctor use a Breslow number or a Clark number to describe your prognosis (outlook). These two methods of staging melanoma are only used if the melanoma is confined, meaning it has not spread to any lymph nodes or another organ in the body. a Clark number to describe your prognosis (outlook). These two methods of staging melanoma are only used if the melanoma is confined, meaning it has not spread to any lymph nodes or another organ in the body. Here is how to interpret them. First reported by Alexander Breslow, MD, in 1970, the Breslow thickness is defined as the total vertical height of the melanoma, from the very top (called the "granular layer") to the area of deepest penetration in the skin. An instrument called an "ocular micrometer" is used to measure the thickness of the excised (removed) tumor. less than 1 mm: 5-year survival is around 92 percent to 97 percent—meaning 92 to 97 people out of 100 people will be alive 5 years after being diagnosed with a melanoma that is less than 1mm in thickness. Due to its accuracy in predicting outcomes, the Breslow thickness has been incorporated into the standard TNM staging system for melanoma. In fact, the Breslow thickness is an extremely important prognostic factor in melanoma, along with tumor (T) stage, and the existence of skin ulceration (broken skin, bleeding, swelling). This all being said, Clark's levels are rarely used for calculating prognosis now. This is because research has shown them to be less predictive of outcome, less reproducible, and more subjective than the Breslow depth. Other disadvantages of this staging system are that it is often very difficult to differentiate between Clark Level II and Level III, and it can't be used on melanomas of the palms and soles. There is one instance in which Clark’s levels may be used to predict prognosis—in patients with thin (less than 1.0 mm) melanoma. Even then, it is only used as a default if the mitotic rate of the thin melanoma cannot be determined. The mitotic rate refers to the number of cancer cells that are dividing. A higher mitotic rate indicates that the cancer is more likely to spread. Try not to get too bogged down in the details of the melanoma staging process. Instead, focus on what the stage of your cancer means for your treatment and outlook. American Cancer Society. (May 2016). Melanoma skin cancer stages. American Cancer Society. (May 2016). Survival rates for melanoma skin cancer, by stage. Balch CM, et al. Prognostic factors analysis of 17,600 melanoma patients: validation of the American Joint Committee on Cancer melanoma staging system. J Clin Oncol. 2001 Aug 15;19(16):3622-34.